The year 1997 marked the fiftieth anniversary of the publication of John Hope Franklin’s literary landmark From Slavery to Freedom. Now in its seventh edition, translated into five languages, with more than three million copies sold, this book, more than any other, has reshaped the way African-American history is understood and taught. 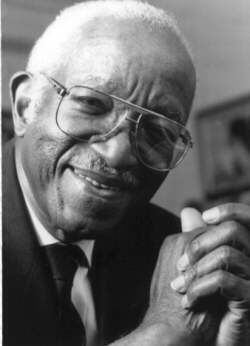 After writing it, John Hope Franklin (1915-2009) became one of the world’s most celebrated historians. Born in Rentiesville, Oklahoma, and raised in Tulsa, he graduated from Fisk University in 1935 and earned a master’s and a doctorate in history from Harvard University. He credited his “careful training” at both schools with helping him to achieve the scholarly discipline necessary to write the story of his race — including painful events that touched his own life — with the historical accuracy and clear sense of fairness that characterize the book. With his wife’s support and a contract from publisher Alfred A. Knopf, Franklin began research on From Slavery to Freedom at the age of thirty-two while on the faculty of what is now North Carolina Central University in Durham. “My challenge,” he said, “was to weave into the fabric of American history enough of the presence of blacks so that the story of the United States could be told adequately and fairly.” When the book first appeared, few people took the study of African-American culture seriously. Although From Slavery to Freedom is his best-known work, Franklin was a prolific author. In 1990, a collection of essays covering a teaching and writing career of fifty years was published under the title Race and History: Selected Essays, 1938-1988. In 1993, he published The Color Line: Legacy for the Twenty-First Century. His most recent book, My Life and an Era: The Autobiography of Buck Colbert Franklin, is an autobiography of his father that he edited with his son, John Whittington Franklin. John Hope Franklin is James B. Duke Professor Emeritus of History at Duke University and has also served on the faculties at St. Augustine’s College, Howard University, Brooklyn College, and the University of Chicago. A former president of the Southern Historical Association, the American Historical Association, and the United Chapters of Phi Beta Kappa, he has received dozens of major awards and more than 100 honorary degrees. In 1995, he was awarded the Presidential Medal of Freedom, the nation’s highest civilian honor. That same year the John Hope Franklin Research Center was founded at Duke as a repository for African and African-American studies documentation. Last summer, the distinguished Duke historian was appointed by President Clinton to lead a panel of advisers on promoting racial understanding in the United States. Click here for the full story in Raleigh’s The News & Observer, including video of the dedication.